Arroyo de los Martires—a term appearing as " R. de los Mar- tires " on Font's map of 1777, but " R. de los Martinez " by misprint on the reduced copy in Bancroft, and Rio de los Martires having originally been Kino's name of the Colorado in 1699. Hence arose some confusion; but there is not the slightest doubt of Garces' discovery and present position. 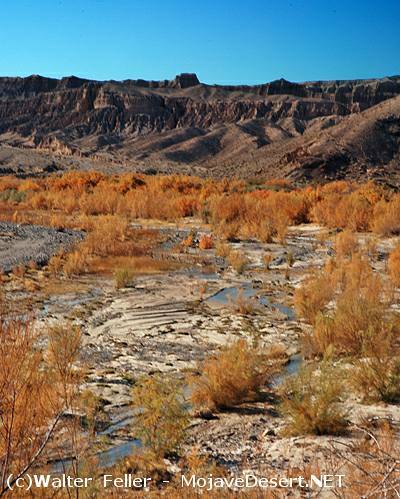 Mojave river has no outlet, but sinks in the sand at Soda lake or marsh, a place which varies much in appearance at different seasons or conditions of water supply. The sink has an extent of about 20 miles from N. to S., but is narrow in the opposite direction, and the main road takes directly across the middle of it from E. to W. when the water is low. When I crossed it was nearly dry except in some reedy patches, and most of the surface was whitened with alkaline efflorescence; the water was bad, as Garces says; the grass was poor, there was no wood, and myriads of mosquitos tormented us, though water had frozen half an inch thick on our buckets on the night of Oct. 31. On the W. side of the sink a road goes northward; the road to follow is the left-hand one, which runs about W. S. W. and strikes the river a few miles higher up, as the river comes into the extreme S. end of the sink. This is Garces' course for to-morrow, " arroyo arriba con rumbo al Oestsudoeste." 11 The distance given should set Garces in the vicinity of a place on the river called the Caves—a usual first stopping place in going up the Mojave from Soda lake.